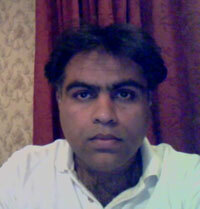 Rizwan Akhtar was born in Lahore, Pakistan. He came to England in October, 2008 to pursue a PhD in English at the University of Essex. His PhD thesis is about Postcolonial literature and theory by women writers. His poems have appeared in Poetry Salzburg, Poetry NZ, decanto, Wasifri, Postcolonial Text (forthcoming), Poesia, Pakistaniat and quite a few have been anthologised by Poetry Forward press, UK. His poetry deals mainly with his homeland, cross-cultural conflicts, space, exile, human suffering and nature. The map of my life is all wrinkled. my alphabets singlehandedly sown in this city. and my fingers dance to a dervish’s manuscript. the rides of passion and jolt. His hands were stained with blood. and those women, hidden behind black veils. now other foods have claimed my palate. on Marx’s monument in Highgate Cemetery. encroach upon the footnotes of history . . .
How have you subdued my images? How do the gardens of Shalimar resonate? and the Punjabi folk tales. and argued with my creator. behind a vendor yelling for a spicy Alo Chat . . .
That remind you of an oasis. Secretly-at night, the arms dangle. Is it a coded smell? they shifted into another paradigm. the dossier is now closed. And the black brief case is full of explanations. before I claim for more indemnity. Because I haven’t given charity for years.